Welcome to The Nocturnal House, Snarklings! It seemed like the best thing to call the new section of Gothic Charm School wherein the Lady of the Manners talks informally about books, because over the years, the Lady of the Manners has stayed up far, far too late into the night, reading vampire books. Yes, vampire books.You see, I read a lot of vampire books. 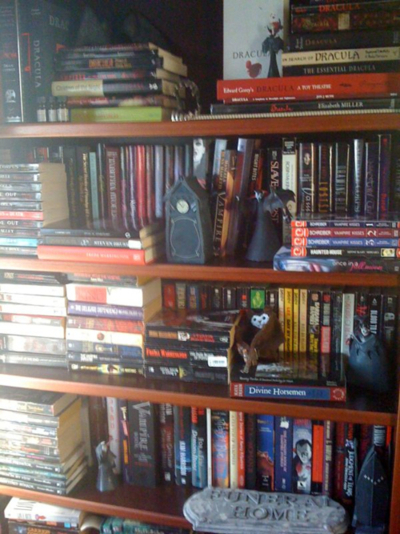 Well, lots of books in general, but a vast amount of my personal library are about the fanged children of the night. – The Nocturnal House isn’t quite going to be the Gothic Charm School book club, but there will be MODERATED comments, in the hopes of getting some interesting discussion going. – The Nocturnal House is going to be a bit more informal in stylistic tone than the usual sections of Gothic Charm School. In other words, the Lady of the Manners will be setting aside the third-person affectation while lounging about in The Nocturnal House. – Clicky-link disclosure! The links to books here in The Nocturnal House go to Powells.com, and are partner links. Which means that if you click one of those links and buy the book, I will, in theory, eventually earn a small amount of money. Who knows if it will amount to anything, but hey! All proceeds will almost assuredly be spent on my addiction to Fluevogs and fancy hats. So! When people ask which vampire books I think are worthwhile, what is the very first book title that I blurt out? Oh, you sillies, can’t you guess? Yes. Start with the bat-winged great-grand-daddy of them all, Snarklings. Trust me on this one. There are other vampire stories that came before (hello, “Carmilla” by Le Fanu, anyone? Yes, go read that and Polidori’s “The Vampyre”), but Dracula has cast a long shadow since its publication in 1897 for some very good reasons. Count Dracula is the King Vampire of literature. He’s evil, he wants to leave his collection of vampire brides in Transylvania to find new thralls in England, and he’s mind-controlling a poor lunatic in an asylum. No moping about his lost humanity, no angsting about being a damned thing, no falling in love with women centuries younger than himself, just flat-out evil. I appreciate that in a vampire. (That’s right, there is no vampire/human love story in Dracula, no matter what the various Dracula movies put forth. The only interests Count Dracula has in Lucy Westenra or Mina Harker are motivated by hunger and control. No tender feelings of romantic longing at all.) That’s not to say I don’t appreciate those other, more classically Romantic-with-a-capital-R, soul-searching traits in vampire books, but those sorts of character motivations need to be handled delicately, else they become tedious very quickly. “When she advanced to him with outstretched arms and a wanton smile he fell back and hid his face in his hands. There was something diabolically sweet in her tones, something of the tinkling of glass when struck, which rang through the brains even of us who heard the words addressed to another. This is the most accurate (and entertaining!) description of Van Helsing I’ve ever read, and the last time I re-read Dracula, I kept cracking up because I was translating Van Helsing’s broad swathes of dialog into exaggerated lolcat syntax. But it is a classic. Jonathan Harker falling prey to Dracula’s brides, Mina’s strange, dreamlike journey to find the sleepwalking Lucy in a graveyard, the trials and tribulations of the bug-eating Mr. Renfield, the confrontation with the transformed Lucy, Dracula’s corruption of Mina — all of these scenes exert a lingering, nightmarish power, and no adaptation in any other media has ever come close to portraying the chilling imagery of the book. If you really want to learn about the book, I highly recommend getting an annotated version, to have footnotes about the plot and historical context of the story. I have a fondness for the New Annotated Dracula, edited by Leslie S. Klinger. Not only is it full of footnotes, but he frames the whole thing as if the novel were a real historical document of events that happened to real people. As in, Bram Stoker knew the Harkers socially, and convinced them to allow him to collect and publish their correspondence to warn the public about the menace of Count Dracula. I found this endlessly entertaining, but your suspension of disbelief may differ. If that doesn’t sound like the sort of annotations you’re looking for, then you may want to stick with the Norton Critical Edition. Another awesome edition is the recent Penguin clothbound classics version (the series with cover designs by Coralie Bickford-Smith that repeat a motif from the plot of each book.) There is a huge amount of footnotes (well, endnotes I guess) and historical context, as well as a biography, timeline, and a few essays. Plus these editions are just a pleasure to handle, as you might imagine. I attempted to read Dracula last year, and I felt like it dragged on and on. But, upon reading your description of the novel, I am inspired to give it a second chance. Thanks for the motivation! I tried reading Dracula, honestly, I tried, but every time I picked it up and read few pages I fell asleep. It didn’t matter if it was 1 am or 1 pm, I would find myself sleeping. I recently bought the Leslie S. Klinger edition of Dracula, and I have to say it is amazing. I LOVE all the extra information, every pack is packed with stuff. It is so much you definitely have to tell yourself to stick to the narrative at least until the chapter is over or you will loose track of the storyline. I found parts of the story very hard to get through, but the atmosphere definitely builds up dread and gloom in a most delicious way. I read the annotated one by Klinger a while ago. However I borrowed it from the library and I got so distraced by the notes I had to continually re-read sections and didn’t finish by the time it was due (and I had renewed it once). I have mislaid my bookmark for the start of the original run, but the comments served as annotations that expanded my context for the book. And the formatting of all the letters and diary entries and whatnot as blog entries breaks the book into neat, bite-sized pieces. Hee hee hee hee! So VERY true! I honestly couldn’t figure out what Helsing was saying most of the time! “Dracula” was required reading for my freshman English class. I adored it, of course, but there was one memorable scene of some late-night (yes, I believe it actually was a dark and stormy night) studying. I realized all at once that I was reading a vampire novel while eating tomato soup at approximately midnight. I tried reading Dracula some time ago, it was hard for me to follow! The humans’ emotions and words were too many for my little brain to understand. After reading this, I am determined to finish it though. Wish me luck! I was so glad my Honors English class gave me an excuse to read Dracula, or else I might never have read it! It gave me a wonderful introduction to gothic literature and influenced my own writing, though it honestly wasn’t what I expected. Now I have to go reread some of Van Helsing’s lines with lolcats in mind!